Looking for hotels near Museum Centre Vapriikki? The 1920s-style Radisson Blu Grand Hotel Tammer is located 164 feet from Koskipuisto Park. It offers free sauna access and free wired internet in all rooms. Tampere Station is 2297 feet away. Located in Tampere, a 14-minute walk from Tampere Bus Terminal and 0.9 miles from Plevna Movie Theater Complex, Central Alexandra offers free WiFi. Scandic Tampere Koskipuisto is centrally located in Finland’s second largest city, close to local sights such as Särkänniemi Amusement Park, Sara Hilden Art Museum and Tampere Hall. Set in a tall, striking building in central Tampere, this modern hotel is just 656 feet from the train station. It offers free WiFi, 3 restaurants and an on-site gym with communal saunas. It was right next to the train station. I loved the sky bar view and live music. Holiday Inn Tampere-Central Station is located 984 feet from Tampere Central Train Station. It features contemporary rooms with air conditioning and free WiFi. Front desk staff. Coffee in the morning from cappuccino bar. Located in a quiet residential area of Tampere, this hotel is 4 minutes’ walk from the city's main street Hämeenkatu. It offers free in-room 1 GB WiFi and 24 hr lobby services. These modern, self-catering apartments are located in Tampere, just 1640 feet from the Plevna Movie Theater Complex and 2953 feet from Tampere Bus Terminal. Good convenient location. Close to city center and a major bus stop area. Hotels with great access to Museum Centre Vapriikki! This hotel is west of Tampere, about a 10-minute drive from the center of the city. It offers free Wi-Fi and free private parking. Särkänniemi Amusement Park is a 5-minute drive away. Located just 1640 feet from Tampere Central Station, Kesähotelli Aurora offers rooms with free WiFi, a work desk and refrigerator. Each room has a private bathroom with shower. 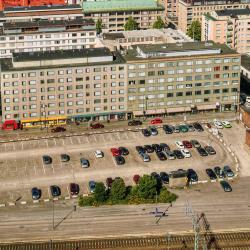 This good-value hotel is 5 minutes’ drive from Tampere Train Station and Tampere Hall. It offers free parking, free in-room wired internet, a laundry room and a guest kitchen with free tea/coffee. The room was small, but nice and cozy. Very comfortable bed, good breakfast. Set in the Lamminpää area of Tampere, this hotel offers free Wi-Fi, free parking and basic rooms with a TV and coffee maker. Tampere city center is a 13-minute drive away. As a surprise, breakfest was also offered.